Most villages would still be clearly recognisable if you stepped back 100 years. But turn the clock back in Santon Downham and you would find a very unfamiliar scene. 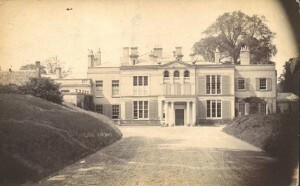 Downham Hall was a seven bay brick house, with a projecting porch and a higher, three floor, three bay centre, with a shallow bow to the rear garden. 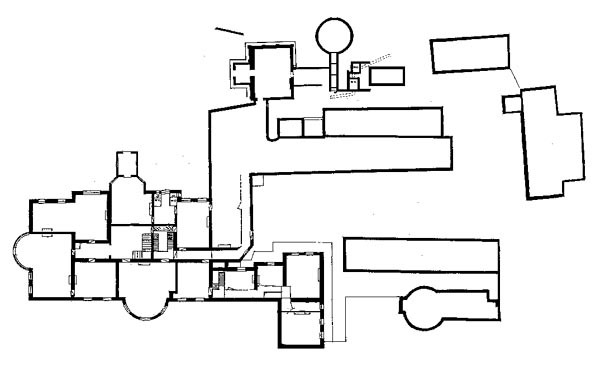 But for such a large building, surprisingly little is known about it, and few photographs or plans survive. The 22 villages team was delighted recently when this postcard was given to us by Ann & Bernard Rush. Four families dominate the estate’s history, starting with the Wrights who lived there for more than 150 years in the 17th and 18th centuries. It was Thomas Wright who brought Santon Downham to public notice in 1668 with his dramatic account of a sand flood and how his house became “almost buryed in the Sand”. A substantial house of 12 hearths was recorded on the site 1674 in Thomas Wright’s day. The Cadogan family was the next to own the hall – it was bought by the 1st Earl of Cadogan, in about 1800. The property was described in the Ipswich Journal at the time of the sale as a “Mansion sashed, fronting South, with all conveniences, gardens, meadows &c… [with] rights of fishing and swanning” . But a mystery remains about exactly when the Hall was built. In 1829, it was described as being “a modern house of apparently the former part of the last century” – so it doesn’t sound like the same place where the Wrights lived 200 years before. It seems likely that the Cadogans replaced, or Georgianised, Wright’s house. The Cadogans used the estate as a shooting lodge – these were becoming popular in Breckland at the time. Records show that new tree plantations were soon established. It is even suggested that the landscaping was advised upon by the great “Capability” Brown, as he was deputy to the Earl, who was Surveyor of the King’s Garden. Lord William Paulett, later the 3rd Duke of Cleveland, took over ownership in 1830. He brought in the architect Lewis Vulliamy in 1836 to carry out alterations, probably as a result of a fire. The beautiful avenues of limes which still lead to the village are believed to have been established by the Duchess. In 1848, Lord Powlett owned Downham Hall, and he was a man with an interest in several railways. In 1860 George West published a poem describing the Downham Hall Estate titled “A Ramble over the Downham Estate”. Edward Mackenzie bought the hall in 1871. By 1879, it was described as a “noble mansion built of white Suffolk brick, situated in a well-timbered park”. It was said to be “the heart of an extensive game preserve, and the gardens are laid out in the Italian style”. During the First World War the men who were stationed in Santon Downham consisted of the British Pioneer Corp and Canadian troops who were lumberjacks responsible for timber production. But no more families lived there after the Mackenzies. The estate was sold for £75,310 in 1918 and owned by a succession of land speculators and companies before its acquisition by the Forestry Commission. 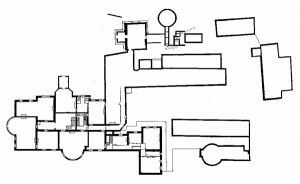 There are several interesting maps and plans in circulation – floor plans of the hall, maps of the estate and county maps that indicate the presence of the hall. 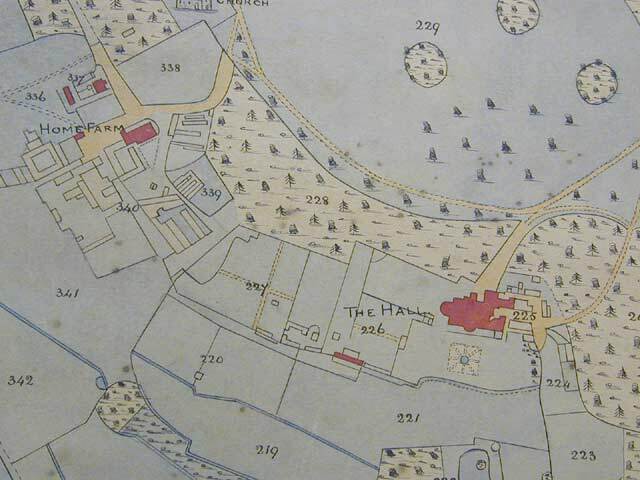 The latest plan to come to light is a marvellous hand drawn map of Santon Downham and the surrounding area dated 1865 and produced by land surveyor William Steff of Attleborough. (see the Gallery for more pictures) It was put up for sale in 2003 through London antique map dealer Jonathan Potter. We went to see it and to take a series of photographs including the one below. This shows just a small part of the map, which is huge – about 5 feet by 5 feet – and clearly needed to be in the public domain in the care of somewhere like a museum. We were therefore delighted when it was bought by the Suffolk County Council Record Office at Bury St Edmunds. The map is freely available for research and its reference number is HD2594. 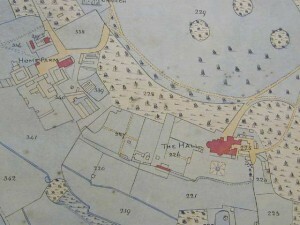 We try to scan or photograph any maps, plans and other material that we come across to safeguard them for posterity, and hope to put a gallery of some of the others online in due course. In the meantime, please contact us if you would like to know what we have, or if you have material to add to the collection.